Williams Electrical Service was established in 1954 and has a proud history. Our values are Reliability, Innovation, Quality and Service. These values have remained the backbone of our culture. They are encouraged in all our people and guide our actions. At Williams Electrical Service we aim to provide the most responsive customer-focussed service; embrace change and always look for a better way; we are committed to continuous improvement to help improve our performance; and aspire to deliver exceptional customer service and support. This approach enables us to present opportunities that create maximum value for money, and deliver projects and services within a collaborative and aspirational environment. It ensures we look to the future with confidence and optimism. The owners and directors of Williams Electrical Service continue to reinvest in a company that has grown to be respected as innovative in the industry whilst remaining conservative in its nature. We are very committed to our clients; the present company size allows customer demands to be met, whilst still allowing for a degree of personalised integration. Since its foundation in 1954 Williams Electrical Service has grown to over 100 employees. We are deeply committed to our industry and invest in our people. Underpinning everything we do is safety - making sure each of our employees go home each day is our number one priority. Williams Electrical Service has grown to be respected in the industry. We owe this to our team of professionals – who are our greatest asset. We encourage a high level of business ethic and customer service from our team and in return we work with them to develop their skills and further their careers. We provide comprehensive professional development opportunities for our team ensuring they are fully trained and have the qualifications and licensing to handle all tasks. We also actively promote the development of apprentices and trades assistants through first class training programs and a highly regarded apprenticeship program. We make sure our people and their work environments are as safe as possible. For over six decades, we’ve fostered a safety culture of leadership and commitment to continual improvement. It is a culture that not only helps us to keep our people safe, but one that promotes respect, and adds value and improvement to our safety and performance outcomes. A key objective of Williams Electrical Service is a commitment to continuous improvement and this intense focus on quality extends to all areas of the business. The result ensures that our clients remain satisfied with both the finished product and ongoing maintenance. 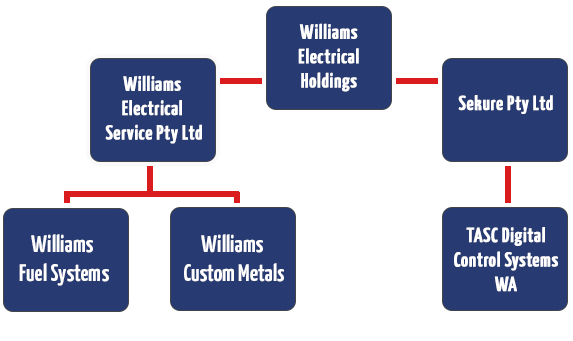 Williams Electrical Service was founded in 1954 and is part of the privately owned Western Australian company Williams Electrical Holdings. This enables all parties to draw on synergies across the structure and offers an extremely efficient combination of resources. In 1999, Williams Electrical Service formed a dedicated division to deliver fuel systems - Williams Fuel Systems. The focus of Williams Fuel Systems is to work closely with mining, retail, commercial and industrial clients to ensure fuel works are safely completed and maintained. Further, in 2005 Williams Electrical Service formed Williams Custom Metals. A unique aspect of Williams Electrical Service is our procurement agreement with Lawrence and Hanson, (L&H) in that a fully stocked L&H branch has been established within our business premises for over 12 years. L&H employs four permanent full-time staff members who are appointed to the branch with the sole purpose of supplying and/or managing all goods used by Williams Electrical Service and other divisions. The organisational chart depicts the company relationships and innovative partnership. Williams Electrical Service has over six decades of history delivering projects and services to Western Australia – of which we are very proud. Throughout this time our values have remained the backbone of our culture, they are Reliability, Innovation, Quality and Service. Hover over the points below to discover key milestones in our journey so far.